Not long ago I called in at a small antique shop where I usually scanned the books pretty quickly and there was an old book, front cover missing , back broken, the whole thing just about hanging together in four parts. A quick look suggested it was about the history of Europe so on the spur of the moment I bought it, and for a song. 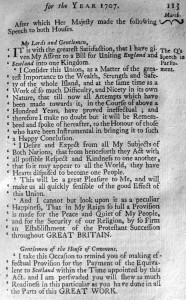 It was a while before I realised it was “A Compleat History of Europe etc for 1707”, published in 1708, and it included the final stages of the Act of Union with Scotland. At this time an old friend from Toronto visited us. On retirement he had trained as a book binder and restorer. He offered to rebind it and within a month I had a fine antique book. 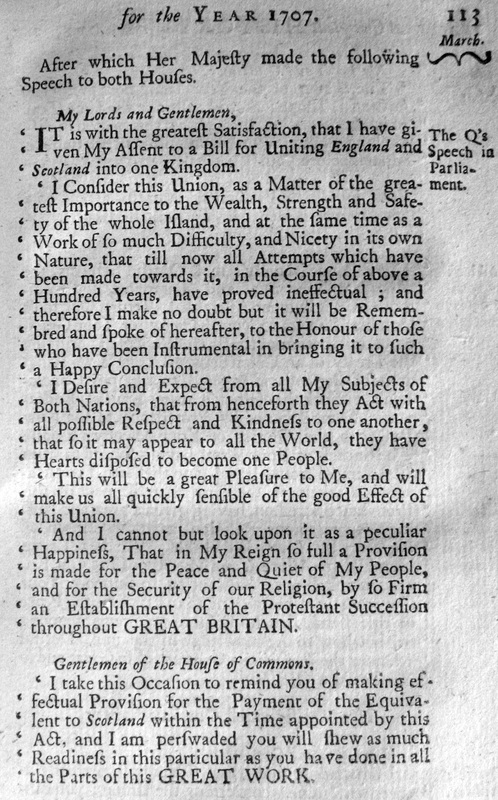 I reproduce here the page recording the speech Queen Anne gave to both Houses of Parliament after she had given the Royal Assent to the Act of Union on 6th March 1707.